What if a catastrophic event also made superhumans of a few people? Some would be good/altruistic, and some would be bad/evil. Crime fighting would take on a whole new dimension. Mr. Ekeke writes an excellent speculative story about how relationships and the world would change. Greyson must hide his talents while fighting both crime and government control, but he has help from a government-sanctioned superhero. What a great series! Ok, so to start, this was an excellent read; thoroughly enjoyed it. As other reviewers have indicated, the opening is a bit slow, but this is well worth the it as this is the foundation and actual draw into the world and characters the author is introducing. This is a quietly amazing take on super heroes, which in many ways was/is a nice redirect from what many may find to be the typical super hero "coming of age" angst and whine plot with accompanying fillers. The best compliment I can give is that this book feels like a paperback; the characters, the immersing story, descriptive writing style, all give a throwback feel to paperback...as opposed to some of the high gloss writing one may find in some of today's digital offerings. I highly encourage others to try this author's work, as I look forward to part 2 in this series. I am now even intrigued to perhaps visit the Starbrigade series.... Enjoy! The problem is that the author first wants to follow 3 different characters. A high school boy from this universe's version of Metropolis. A reporter working in the same city. and finally a secret super from the Midwest who fears his own ability (for good reasons). So we end up jumping around depending on who's chapter it is. Which is never a good thing for a fairly new author. Stick to one character and ride them to the finish of the tale. The third plot thread was another with potential, but it seemed to have nothing to do with the other 2 and wasn't even in the same city. I know the author is working on book 2 and promises to bring all this together. Maybe after that comes out I'd be inclined to raise my star count (not likely), but that requires that I decide to risk another romp through this less than impressive world. Good to a point, but very lacking due to the 3 divergent plots. Honestly, this is for those that love the genre. Good story with relatable characters. I am very much looking forward to part two. I like that much of the world building is done though the characters experiences (instead of through boring exposition). I also like the various viewpoints... Gives a nice look at a series of events without overwhelming your ability to remember who is who. I do want to know more about some of the bad guys. Some of the fights felt very 'hero defeats subvillain 3', but that is a minor quibble. I recommend this book to anyone who loves superhero stories. 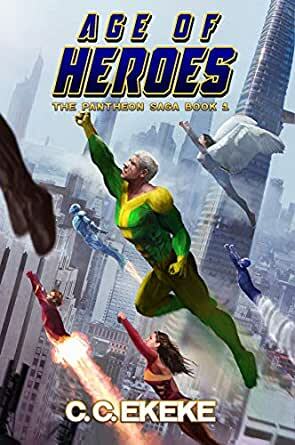 This is comic book heroes in novel form and I love it. This harkens back to me reading comic books and all the different superheroes and how they tried to lead normal lives along with their superhero lives and it's a murder mystery all rolled into one. This is an interesting take on superheroes. I thoroughly enjoyed reading this book and I recommend it to people who liked the show heroes will love this book. More Please!